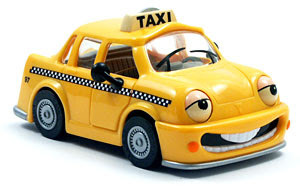 Beloved Bedlam: Meet "TYLER TAXI"
Only problem is they are no longer making this car.... So now I just have to find one! I'm not setting this in stone. I reserve the right to change my mind. Remember how I named Riley "Ashton", and his name is Riley.. That could happen.. I'm just saying. Love the name Tyler! Also... I am so impressed you remembered Skyler's birthday date. You were right! I am like you and love numbers. Funny the things that we have a fetish for. Good! Tyler was my vote. I love it. Middle name??? Wow Jamee you are amazing to remember all those dates and birthdays. I have the worst memory. I love the name Tyler. My sister Jeni's youngest boy is Tyler. I love reading your 1000 things.